Chancellor Angela Merkel was long considered a skeptic when discussion turned to a German seat in the UN Security Council. Over her ten-year reign, she has viewed this more as a crazy idea inherited from her Social Democrats (SPD)-Greens coalition predecessors, who despite their campaign had nevertheless refused to risk a vote (non-binding, mind you) of the UN General Assembly on the matter. But in late September of this year, when Merkel met in New York with allies India, Brazil, and Japan to discuss UN reform, her tune had suddenly changed. 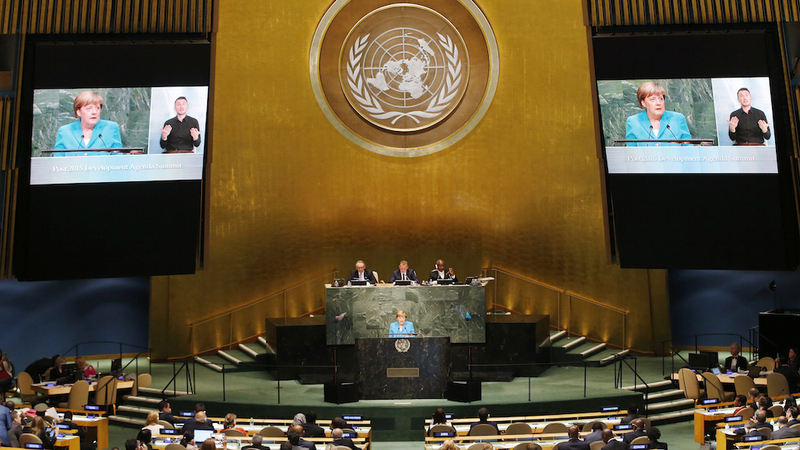 “I believe … there is a mood that makes clear: Not only we four countries, but also many others are no longer in agreement with either the structure or the working methods of the Security Council,” she said. The so-called G4 group are now pushing for “urgent reform”. Thus, autumn 2015 represents the start of German foreign policy’s next emancipatory phase: In early 2014 the Munich Security Conference marked the beginning of the public debate about the greater degree of responsibility the EU’s largest economy should assume in foreign affairs. The defensive position held at the time has now by necessity given way to an offensive one. The German government is not only ready to assume greater responsibility, it is now actively pushing for this responsibility itself: from Ukraine to Iran, from Libya to Syria, Berlin’s leaders have made clear that they want and will have a seat at the table. Insistence upon permanent membership in the highest UN body is only one element of this strategy. 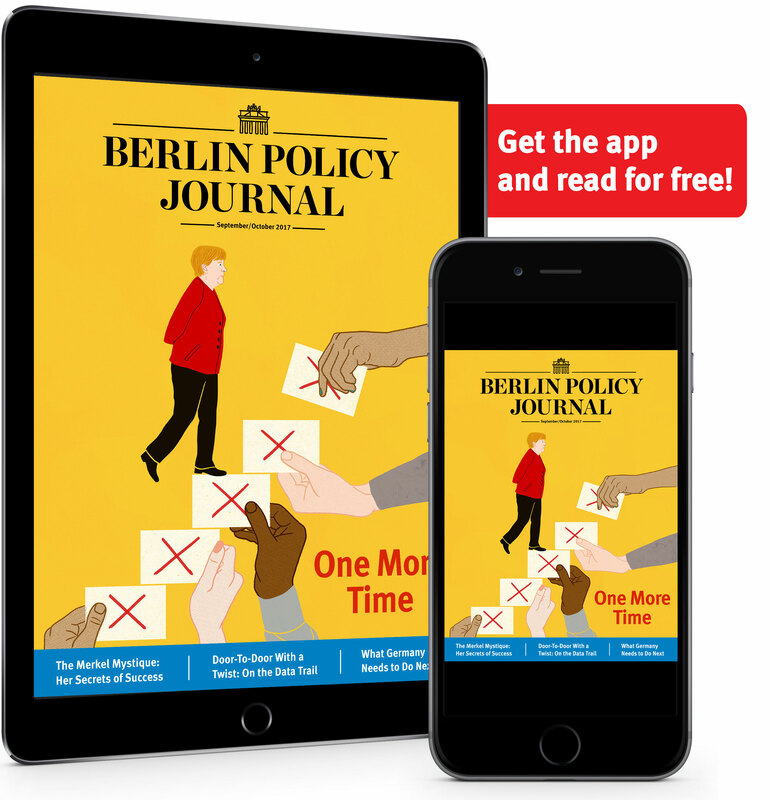 Berlin has made the decision to assume an active role immediately, at the very least for the stabilization of the entire crisis zone surrounding the EU – stretching from the Maghreb at its westernmost edge across Egypt and the Middle East to Belarus. There are two reasons for this. The first is the overwhelming shock and resultant domestic pressure in the face of the singular wave of refugees currently expected to deliver over one million asylum seekers to the country this year alone. The second is the increasing sense that Berlin can no longer rely on its European and international partners to step up as needed. Merkel’s sober – and for many, too matter-of-fact – analysis of the refugee crisis has been that this problem cannot be solved in Germany, on the German-Austrian border, nor even at the EU’s external borders alone. Despite domestic demands for speedy solutions, Merkel, together with Social Democrat Foreign Minister Frank-Walter Steinmeier and Minister for Economic Affairs Sigmar Gabriel (the SPD party leader) as well as her Christian Union (CDU/CSU) party colleagues Defense Minister Ursula von der Leyen, Interior Minister Thomas de Maizière, and Development Minister Gerd Müller, has stressed that relief can only come through cooperation with non-European countries and a common fight against the very conditions which have led to the exodus. In Germany’s view, therefore, the EU must take a vast number of actions in order to restore functioning governmental structures in countries like Libya, to reach a cooperation agreement with Turkey on refugee issues, to halt the civil war in Syria, and to ensure proper care and support for Syrian refugees in Turkey, Jordan, and Lebanon. This will require, according to German government leaders, both considerable rethinking as well as addressing nationalistic reflexes which have been exposed across a number of EU states, including Germany. In response to these, Merkel has underlined more than once that “fences around Germany will not help.” The same applies to the Hungarian wall, a structure relieving no one but that country alone of its duties. A general policy of returning the refugees to Austria is also impossible, because the German government can see this would unleash a fatal chain reaction: every smaller European country along the so-called Balkan route could fall into chaos. Attempts at a common European solution and the preservation of passport-free travel within the Schengen zone would be completely destroyed by such a singularly nationally-focused action. For this reason, an alternative set of rules addressing everything from improved EU external border protections, to common asylum procedures, to a binding quota for union-wide refugee distribution are being negotiated with great haste. Germany self-critically recognizes that it was long a country which not only did not support, but in fact actively prevented the EU Commission from moving forward with exactly these changes. 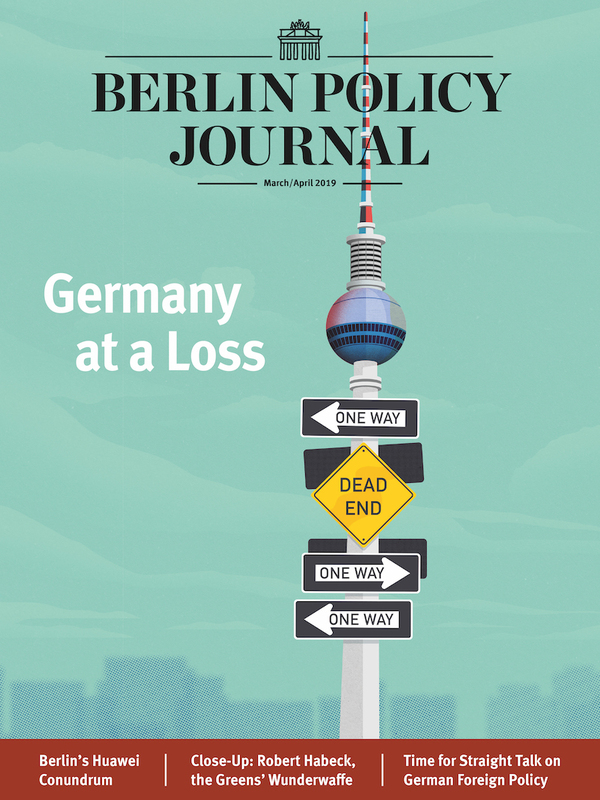 Unfortunately, from the German government’s point-of-view, these necessary European policy changes no longer go far enough: Over the past two decades, the German credo has focused on the continued coalescence of domestic and European policy. At the moment, however, Merkel’s rhetoric and train of thought resemble those of an international development aid organization: Even domestic and world politics are bound ever more tightly. On public television’s political talk show “Anne Will”, the chancellor admitted that she had long believed countries like Syria, Iraq, or Afghanistan to be far, far away. She elaborated her new One World-thinking thusly: “And suddenly we see that there are people running for their lives to such a degree that long distances like these are suddenly shrunk down to nothing, and they come to us in the EU, making us part of these conflicts and unable to differentiate between domestic and foreign policy.” She further pointed to the ways in which tools and methods of communication and information-sharing like smartphones have caused the world to grow together. Merkel also commented that the high number of EU citizens who are fighting alongside the radical Islamic State (IS) in Syria and Iraq alone would have qualified Europe as an actor in this Middle Eastern conflict. Her conclusion: Rather than looking away, as we have done before, we must engage even more strongly in the future “so that people can stay in their homeland, and perhaps we will not face so much integration work.” In other words, every euro spent in a crisis country helps us spare many more that would have to be spent to clean up the mess of failures in other parts of the world. Every current foreign policy attempt can assist in the prevention of domestic problems later. Berlin is beginning to sing the holy anthem of diplomacy. “We have a joint responsibility for the unstable regions surrounding us,” German EU Commissioner Günther Oettinger stressed on October 18. Thus countries like Turkey, Iran, Saudi Arabia, or Egypt are moving into the forefront of German foreign policy – and no longer simply for export promotion. On October 18, Merkel flew to Istanbul to sound out the degree to which Turkey will let itself be drawn into joint efforts to contain the flood of refugees – despite the fact that the country found itself in the middle of an election campaign. At the same time, Steinmeier visited Iran and Saudi Arabia. Just in the past year, the German government’s delivery of weapons to the Iraqi Kurds eliminated two old German taboos simultaneously: for the first time, Germany both supported a militia group and delivered weapons directly into a war zone. The German Foreign Office further heavily supported the UN special envoys to both Libya and Syria in their attempts to get every conflict actor to the negotiating table. New realpolitik thinking is seeping into the otherwise strongly morals-focused German debate. “Finding something wrong and negotiating at the same time are not mutually exclusive,” Merkel said on October 8. In a TV interview, Merkel rebuffed criticism of her talks with highly polarizing Turkish President Recep Tayyip Erdoğan by noting that it was her “damn duty” to coordinate with Turkey. Suddenly, the argumentation in an entire line of policy fields is shifting. In New York in late September, Merkel explicitly acknowledged the goal of spending 0.7 percent of GDP on development goals – which, given the current spending level of just 0.4 percent, will result in considerable spending increases and a necessary reorganization of Germany’s annual budget. Defense Minister von der Leyen further explained that foreign military missions are a direct contribution to efforts to keep people in their homelands – at least in Afghanistan, Mali, and Iraq. This too will lead to additional governmental spending. Both Merkel and Environment Minister Barbara Hendricks have argued that an ambitious international climate strategy is an important contribution to the prevention of the next wave of refugees, because people will increasingly be forced to flee their homes due to environmental degradation. Germany is thusly fortifying not only classic developmental strategies, but also its own commitment to climate protection: the country has promised to pay one-tenth of the $100 million contribution promised annually from 2020 by industrial nations to developing countries for their climate protection efforts. If Berlin Doesn’t Do It, Then Who Will? The other motive for Germany’s rising diplomacy efforts is an incipient sobriety with regard to the competencies and the political will of the country’s European and international partners. In the EU, the European Council president and the Commission have in Berlin’s view long failed to recognize the immediacy of the refugee crisis. And the 28 member countries have not shown adequate decisiveness in undertaking realistic burden-sharing measures, neither in terms of the refugees themselves nor in external border protection. Despite Merkel and Steinmeier’s attempts to form a common EU foreign policy, they both share the opinion that Berlin must once again negotiate alone and bring its weight as the EU’s largest economy and current haven of political stability to the table – as it did in the Ukraine crisis. Thus, the government increasingly focused its energy on sparking activity through, in the words of one top diplomat, its hand-holding and “cheerleading” of the others. At the EU summit on October 16, Merkel complimented the EU Commission on finally recognizing the seriousness of the situation and putting together over just a few days an action plan for closer coordination with Turkey. This disillusionment applies even to the five veto powers of the UN Security Council. Expectations of China, a country which has long abstained from involvement in international crises, are the lowest of the bunch. That said, the country had still been part of the successful nuclear negotiations with Iran. At the same time, the Chinese leadership made clear through its actions in the South and East China Seas that it is now prepared to flex its military muscles when it comes to defending its own national interests. In Berlin’s view, UN veto-holder Russia, under President Vladimir Putin, has proven that it sees itself as more of an opponent to the post-1989 European peace framework than the partner all had once hoped it would become, especially since the dawn of the Ukraine crisis and above all its annexation of Crimea. “If any proof is still needed that the Kremlin exercises massive influence over the hybrid warfare methods of eastern Ukraine’s separatists, then consider the fact that at the very moment when Russia engaged in Syria, the [Ukrainian] conflict stopped virtually overnight,” said von der Leyen on October 17. Following Russia’s attacks on Syria, therefore, the German government has pushed for Moscow’s inclusion in finding solutions, despite the fact that Russia’s support of Syrian President Bashar al-Assad and its bombings of non-Islamic State opposition groups has made it, much like in Ukraine, ultimately part of the problem. Berlin’s opinion of the three Western UN veto powers is currently little better, though. Every demonstration of transatlantic and European partnership in the past few months has been met with the same criticism by leading German politicians of all stripes, namely: Our Western partners either cannot or do not want to make a decisive contribution to the stabilization of the crisis zone surrounding the EU. On October 18 Chancellery Chief of Staff Peter Altmaier pointed out that it was the Middle Eastern order wrought by France, the UK, and the US that was presently collapsing. The UK no longer plays the same decisive role in Europe’s foreign policy that it once did, even if London contributes heavily in specific cases, such as the recent financing of refugee camps in Syria’s neighboring states. In Germany’s view, the UK and France contributed to the fall of the Libyan government with their military intervention without so much as a concept for the necessary stabilization of the country in its aftermath. These countries thereby created an unintended hole through which smuggling bands transport refugees to Europe – refugees that neither country is prepared to assume responsibility for in any reasonable quantity. French President François Hollande may be Merkel’s close partner when it comes to European policy, but he allegedly has the tendency of using foreign military deployments as a short-term means of raising his domestic political profile. A public German-French spat over the unannounced French air attacks in Syria outside of the US-led alliance did not break out only because Merkel needs Hollande’s support in many other areas. With great effort Berlin concealed its anger that Hollande had delivered Putin a perfect set-up and apology for Russia’s unilateral action in Syria just a few days later. The disillusionment with US President Barack Obama also looms large. The German government has acknowledged that given China’s increasing strength, the US is bound to give greater focus to the Asia-Pacific region. Merkel and Steinmeier therefore cautioned in 2014 that the EU must play a greater role in resolving conflicts in its own neighborhood. At the same time, members of all parties accused Washington of lacking vision and rigor in the very areas of foreign policy most important for Europe. In their decisive response to Russia’s annexation of Crimea, Obama and Merkel were still united. But as the US president insulted Russia by calling the country a “regional power”, Berlin, alarmed, could only shake its head: Such a move demanded even stronger actions from Putin to amplify Russia’s attempts to raise its own profile – attempts which play out on Europe’s, not Washington’s doorstep. Merkel and Steinmeier repeatedly pushed their American counterparts over the past few months to get over their own superpower pride and at the very least to negotiate with their Russian counterparts over how to de-escalate those crises Putin plays an active role in. And in his attempts to avoid making or even to correct the mistakes of his predecessor George W. Bush, Obama’s promise to withdraw troops helped tip Iraq, Syria, and Afghanistan into even greater chaos and created a vacuum which strengthened the radical IS, an opinion held not just by many Republicans in Washington. Only after pressure from his NATO partners, including Germany, did Obama correct his Afghanistan decision in mid-October. Merkel and Steinmeier today openly warn that the collapse of the Iraqi and Libyan states paved the way for the rise of IS and other terrorist organizations and that the international community should not be allowed to make the same mistake again in Syria. The German government had largely been removed from international efforts in Syria. Berlin first pushed the regime-change rhetoric of its Western allies with regard to President Assad as hard as it has the resulting disavowal of the very same maxim over the past few months as the fight against IS has grown in importance. Steinmeier welcomed US coordination of Western and Arab air attacks against IS forces in Syria. Germany’s military campaign against IS, however, will remain limited to deliveries of arms to Kurdish Peshmerga in Iraq. In October, Berlin followed with alarm as new battles in Syria triggered another wave of refugees from the war-torn country – and without anyone beyond UN Special Envoy Staffan de Mistura even attempting to reconceptualize political deescalation. Nuclear powers Russia and the US appeared ever more strongly as if they would gamble on such a proxy war turning into a direct conflict. Germany as Mediator – Also in Syria? For this reason, German diplomacy has ramped up its engagement in Syria since September as well, making Germany 2015’s unrecognized international negotiations champion. Berlin played a central role in every significant negotiation of the year, from the Ukrainian Minsk Agreement to the long-standing Iranian atomic conflict and even the Greek euro debate. Applying its typical soft diplomacy strategies, the German Foreign Office even made it possible for every party in Libya’s civil war to sit together around a Berlin table. This new decisiveness is illustrated by the fact that a German diplomat, Martin Kobler, will next take on the role of UN special envoy to Libya – despite the fact that Mediterranean countries such as France or Italy have traditionally viewed northern Africa as their domain.